Burckhardtweg 2, 37077 Goettingen, Germany. To evaluate the influence of the cruciate-deficient canine stifle joint on the hamstrings and quadriceps muscle by means of electromyographical and histopathological examinations, forty dogs with rupture of cranial cruciate ligament were examined. Dogs were divided into two groups according to their duration of lameness. Spontaneous electrical activity was found mainly at the semitendinosus muscle in both groups. The thigh muscles showed a trend towards the appearance of spontaneous activity, preferentially in the muscle of the diseased limbs rather than the healthy limbs. Dogs in group 2 tend to have more severe electromyographical changes than dogs in group 1. Major findings on histopathological evaluation were single fiber atrophy and signs of degeneration and regeneration. Unilateral rupture of the canine cranial cruciate ligament induces different electromyographical and histological alterations in the hamstrings and quadriceps muscle of the affected and contralateral healthy limb. These alterations could be caused by hypo activity and an altered anatomical axis of the diseased limb and increased overload of the healthy limb. Injury to the cranial cruciate ligament is the most commonly diagnosed orthopedic condition of the stifle joint in dogs . Cranial cruciate ligament rupture is a complex multifactorial problem that requires a thorough understanding of the biomechanics of the stifle joint, with reference to functional anatomy, patient conformation, and gait analysis, if it is to be solved . Notwithstanding the numerous publications in the veterinary literature on the etiology, diagnosis and treatment of cranial cruciate ligament injury, there is a lack of knowledge about the involvement of the muscles of the cruciate-deficient canine stifle joint. The hamstrings muscles are agonists of the cranial cruciate ligament because they prevent the cranial drawer and internal rotation of the tibia. In contrast, contraction of the quadriceps muscle leads to increased cranial displacement and internal rotation of the tibia. Analysis of gait patterns in humans with rupture of the anterior cruciate ligament shows that rupture of the cranial cruciate ligament causes increased voluntary electromyographical activity in the hamstrings during knee joint motion. Furthermore, affected humans show decreased electromyographical activity in the quadriceps muscle [3-7]. Histopathological examination of the quadriceps muscle in humans with rupture of the anterior cruciate ligament shows selective atrophy of type 1 muscle fibers [8,9], selective atrophy of type 2 fibers in the lateral vastus muscle , or atrophy of both types of fiber [3,11]. The aim of this study was to evaluate whether the altered biomechanics of the cruciate ligament-deficient stifle joint exert an influence on the physiology and morphology of the muscular system. Our hypothesis was that rupture of the cranial cruciate ligament would induce altered biomechanics of the stifle, which would lead to measureable consequences on the stifle muscles (quadriceps and hamstrings muscles). Forty dogs with unilateral rupture of the cranial cruciate ligament were investigated in this study. The dogs were divided into two groups according to their duration of lameness. Dogs in group 1 had shown a period of lameness for fewer than 21 days, while dogs with duration of lameness of more than 21 days were assigned to group 2. All dogs were treated surgically. Each dog underwent complete physical examination. The diagnosis of the rupture of the cranial cruciate ligament was based on a positive cranial drawer sign and tibial compression test. Lateral radiographs of the stifle were obtained to aid in diagnosis and to rule out other bone or soft tissue abnormalities, as well as to document the degree of degenerative joint disease. Signs of stifle disease were shown to be absent from the contralateral side on clinical examination. Pre-operative, the dogs were treated with meloxicam (initial 0.2 mg/kg). Anesthesia was induced with levomethadone (1 mg/kg) and acepromazine (0.4 mg/kg) or levomethadone (0.5 mg/kg) and xylazine (2 mg/kg). Anesthesia was maintained with isoflurane in oxygen. Lincomycin (20 mg/kg q. 12 h) was administered perioperatively. The dogs were positioned in lateral recumbency and the diseased hindlimb was prepared for aseptic surgery. EMG (Neuro Screen Basis, SN 621529, Jaeger, Hoechberg, Germany) of the gracilis, semitendinosus and rectus femoris muscles of both hindlimbs was conducted under general anesthesia just before surgery. The technique of electromyographical investigation was performed according to published recommendations [12-14]. The needle was inserted perpendicular to the fiber in the middle of the muscle. Activity was measured in multiple locations in each muscle. First, insertional activity was evaluated [15,16]. Positive sharp waves (PSW), fibrillations (fib) and pseudomyotonic and myotonic discharges were registered. Lateral arthrotomy was required to confirm the diagnosis of a rupture of the cranial cruciate ligament. The remnants of the ruptured ligament were removed and the menisci were inspected and removed if necessary. The intra- and extracapsular imbrication method was applied to close and stabilize the stifle joint. Muscle biopsy specimens were obtained using an open surgical technique. Bundles of fibers were taken from gracilis, semitendinosus and quadriceps muscles of the diseased limb. The samples were collected from parts of the muscles that were not investigated using electromyography. The samples were frozen immediately in isopentane, which was cooled to -135°C with liquid nitrogen. Biopsy specimens were sectioned and stained with hematoxylin and eosin, modified Gomori´s trichrome  and with oil red. Nicotinamide adenine dinucleotide-tetrazolium reductase (NADH-TR) activity was assessed by staining, and the myosin adenosine triphosphatase (ATPase) activity was observed at pH 9.4, following preincubation at pH 10.4 . In addition, the acid phosphatase activity was analyzed. Post-operative, the dogs were treated with meloxicam (0.1 mg/kg), lincomycin (20 mg/kg q. 12 h) and infusion with electrolytic solution (Sterofundin® Braun Melsungen). Electromyographical data were analyzed by means of the SAS procedure proc-mixed (SAS Version 9.1). Histopathological data were analyzed by means of the chi squared method. P ≤ 0.05 was considered to be significant. Forty dogs with rupture of the cranial cruciate ligament were investigated. The 29 dogs in group 1 had shown lameness for fewer than 21 days, while the 11 dogs with a longer duration of lameness were assigned to group 2. By means of EMG, pathological spontaneous electrical activity, such as PSW, fibs, myotonic discharges and pseudomyotonic discharges, were found in both groups. Pathological spontaneous activity was found mainly in the semitendinosus muscle in both groups. PSW and fibs were the main characteristics of spontaneous activity. Only the quadriceps muscle showed a significant difference between the diseased and the healthy limb in terms of electromyographical changes. The other muscles of the stifle joint showed a trend towards the appearance of pathological spontaneous activity preferentially in the muscle of the diseased limb rather than the healthy limb. This trend, however, was not significant. Regarding the electromyographical findings no significant difference between the groups could be demonstrated. Dogs in group 2 tended only to have more severe electromyographical changes than dogs of group 1, except in the semitendinosus muscle of the cruciate-deficient limb. Pathological spontaneous activity was found more frequently in the semitendinosus muscles of dogs in group 1 than in those of dogs in group 2. The results of the EMG are shown in Figures 1 and 2. Figure 1: Spontaneous activity in thigh muscles (*= p<0.05). 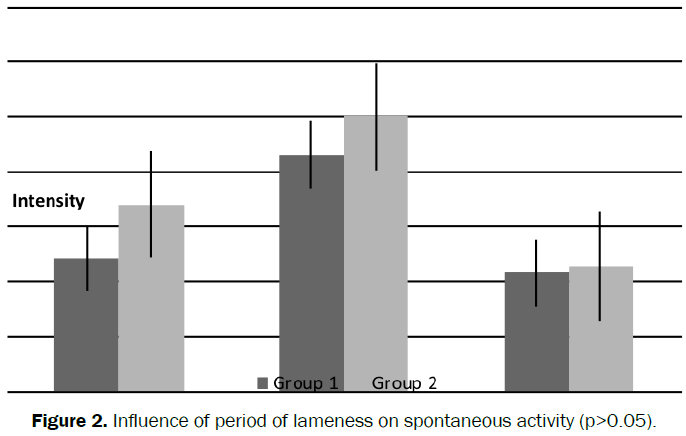 Figure 2: Influence of period of lameness on spontaneous activity (p>0.05). A few dogs showed a higher prevalence of spontaneous activity in the thigh muscles. Both the healthy and diseased hindlimbs were generally affected, and EMG showed frequent myotonic and pseudomyotonic discharges. Histopathological changes in the muscles around the stifle joint were present in 48% of the dogs in group 1 (14 of 29 dogs). In group 2, histopathological changes were found in biopsy specimens from 91% of the dogs (10 of 11 dogs). Dogs in group 2 showed a tendency towards more severe histopathological changes than dogs in group 1 (Table 1). Major findings were single fiber atrophy of no specific fiber type and signs of degeneration and regeneration (Figure 3). These findings were diagnosed mainly in the quadriceps and semitendinosus muscles (Figures 4 and 5). Table 1: Percent of patients with different alterations in group 1 and 2. 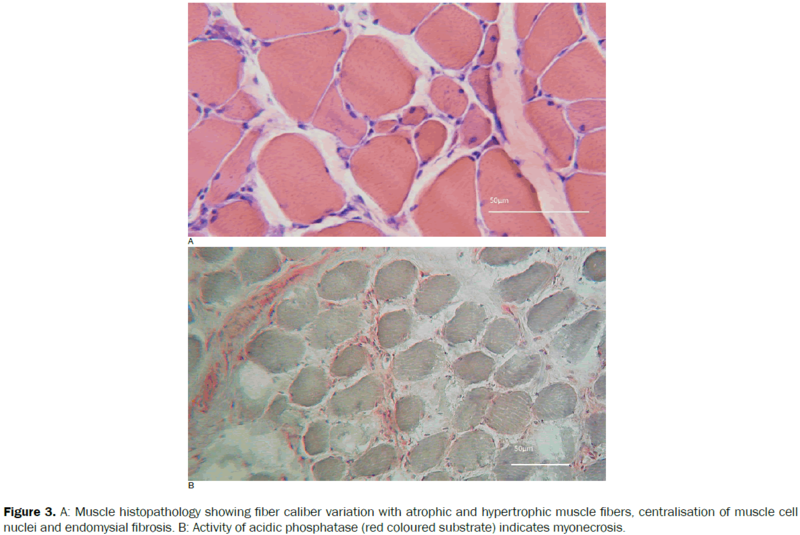 Figure 3: A: Muscle histopathology showing fiber caliber variation with atrophic and hypertrophic muscle fibers, centralisation of muscle cell nuclei and endomysial fibrosis. B: Activity of acidic phosphatase (red coloured substrate) indicates myonecrosis. 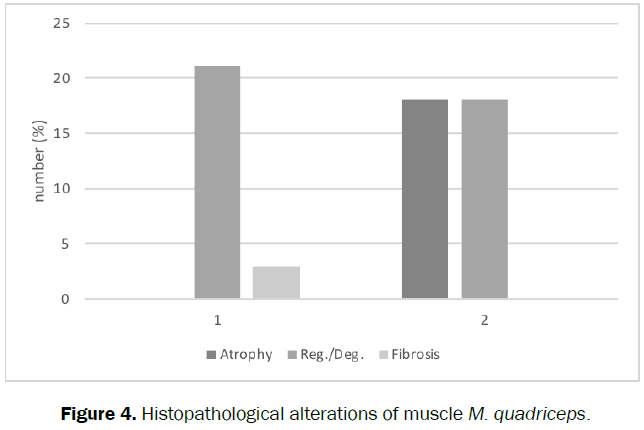 Figure 4: Histopathological alterations of muscle M. quadriceps. 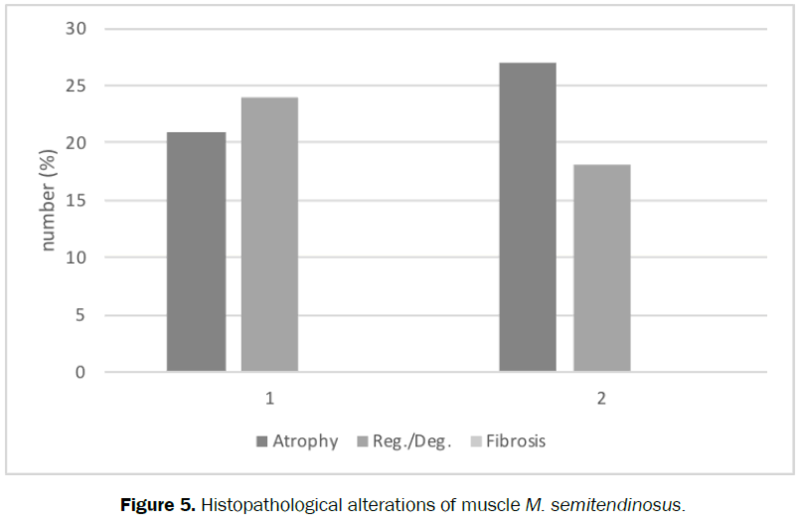 Figure 5: Histopathological alterations of muscle M. semitendinosus. Single fiber atrophy was found mainly in the muscles of dogs in group 2. Signs of regeneration and degeneration were present more frequently in group 1. Fiber necrosis and fibrosis were seen mainly in the graciles muscles (Figure 6). Figure 6: Histopathological alterations of muscle M. gracilles. In both groups, all dogs showed unilateral lameness because of a rupture of the cranial cruciate ligament. Cruciate ligament tears in the contralateral stifle joint were ruled out by a negative cranial drawer sign and tibial compression test in order to use the healthy limb as a normal control. The dogs were divided into two groups according to their duration of lameness. This differentiation was consistent with the observations of Paatsama and Sittnikow  who found initial degenerative alterations in stifle joints about 21 days after rupture of the cranial cruciate ligament. EMG was performed as described in the literature. Histopathological evaluation was used as a diagnostic control and to validate the EMG. Due to a lack of patient co-operation, the motor unit activity and interference pattern are difficult to record in dogs, and only spontaneous activity of the resting gracilis, quadriceps and semitendinosus muscle can be recorded. Therefore, it is unfeasible in dogs to evaluate changes in the voluntary activity of skeletal muscles, such as voluntary avoidance or the response to overload of thigh muscles. To remove the effect of voluntary activity when recording spontaneous activity, the EMG was conducted under general anesthesia. Rupture of the cranial cruciate ligament leads to altered biomechanics of the stifle joint and also to changes in thigh muscle activity. Gait analysis of human patients with rupture of the anterior cruciate ligament showed a reduction in quadriceps contraction and an accentuation of hamstring use. The altered activation of thigh muscles is caused by functional adaptation in order to avoid the anterior displacement of the proximal end of the tibia [6,7,20]. Studies by Solomonow et al. revealed that direct stress on the cranial cruciate ligament has a moderate inhibitory effect on the activity of the quadriceps muscle, but it directly excites the hamstrings muscle simultaneously. It is thought that a reflex arc exists from mechanoreceptors in the cranial cruciate ligament to the hamstring muscle group. In the present study, pathological spontaneous electrical activity of the canine thigh muscles may have been caused by altered thigh muscle activity and gait patterns. Regarding the results of the EMG, the quadriceps muscle of the diseased limb was significantly more often affected than the quadriceps muscle of the healthy limb. This finding confirms the assumption that the functional loss resulting from cranial cruciate deficiency leads to avoidance of quadriceps contraction in order to prevent the tibial cranial drawer sign. Functional and morphological changes in the quadriceps muscle are the consequences. Histopathological or radiographic studies of the quadriceps muscle of humans and dogs with rupture of the anterior cruciate ligament confirm the theory of quadriceps avoidance. These patients show a selective atrophy of type 1 fibers, a selective atrophy of type 2 fibers, a reduction in the diameter of both type 1 and type 2 fibers [3,21-26] or a reduced ratio of quadriceps width to tibal length on lateral radiography between diseased and control limb . In support of the findings of Okada  and Gerber et al. , the results of the present study showed non-specific fiber atrophy and support the theory of quadriceps avoidance. Regarding the electromyographical results, the semitendinosus and gracilis muscles showed a trend towards the appearance of pathological spontaneous activity preferentially in the muscle of the diseased limb rather than the healthy limb. Spontaneous activity was found in the thigh muscles of the healthy hindlimbs of dogs in this study, even though pathological electromyographical activity was not expected in healthy muscles. It is widely accepted that unloading of painful limbs result in overloading of the contralateral limb . This overloading of the healthy hindlimb could be the cause of the detected pathological spontaneous activity. Pathological spontaneous activity was mainly found in the semitendinosus muscles of both hindlimbs. The semitendinosus muscle of the diseased hindlimbs of dogs in group 1 tended to be affected to a moderately higher intensity than those of dogs in group 2. This could have been caused by the pronounced instability of the stifle joints of the dogs in group 1. The stifle joints of the dogs in group 2 showed decreased instability as a result of degenerative processes of the cartilage, and fibrosis of the joint capsule and the surrounding tissue. Maitland et al. demonstrated that the instability of the stifle joint decreases 4 months after the rupture of the cranial cruciate ligament, as a result of increased cartilage thickness, changes in extra-articular connective tissue, and the osteoarthritic process. These changes stabilize and stiffen the stifle joint. The semitendinosus muscle acts as an agonist of the cranial cruciate ligament and prevents anterior displacement of the proximal end of the tibia. The stifle joints of the dogs in group 1 required this increased support to reduce instability. This increased involvement of the semitendinosus muscle in dogs with a period of lameness of fewer than 21 days should be verified by gait analysis. Regarding the electromyographical findings, no significant difference between the groups was observed. The thigh muscles of the dogs in group 2 tended to show more severe electromyographical changes than the thigh muscles of the dogs in group 1. These results could have been caused by the chronic processes of lameness, which had been present in the dogs of group 2 for a longer period than in the dogs of group 1. Furthermore, PSW and fibs could be caused by secondary muscle diseases, which often coincide with the rupture of the cranial cruciate ligament. Although no findings in the physical examination raised the suspicion of metabolic or endocrine diseases, further clinical diagnostics should be performed to exclude secondary muscle disease. As a further differential diagnosis of pathological spontaneous activity, neurogenic myopathies have to be considered. Four to five days after denervation of a muscle, PSW and fibs are found. Histopathological evaluation of muscle specimens does not show evidence of neurogenic myopathies. Therefore, to exclude neurogenic diseases, evaluation of motor unit potentials and electroneurological examination is required. Regarding the electromyographical and morphological examination of the muscles of dogs with unilateral rupture of the anterior cruciate ligament, it is significant that biomechanical changes caused alterations in the morphology and electrical activity of the thigh muscles, which confirmed our original hypothesis. These changes had consequences on the affected as well as on the healthy limb. The detected spontaneous activity could have been caused by hypoactivity of the diseased limb, and by overload of the healthy limb. The quadriceps muscle showed a significantly higher prevalence of pathological spontaneous activity in the diseased limb. This finding could be caused by avoidance of quadriceps activity in order to prevent the tibial cranial drawer sign. The most frequently involved muscle was the semitendinosus; this can be explained by its function as an agonist of the cranial cruciate ligament. These conclusions should be verified by further histopathological evaluation, gait analysis and EMG of thigh muscles during functional activity. To avoid these clinical consequences, emphasis must be placed on early surgical intervention and physical therapy in order to normalize the biomechanical stresses on the joint and the surrounding musculature. Moore KW and Read RA. Rupture of the cranial cruciate ligament in dogs. Compend contin Educ Pract Vet. 1996;18:223-234. Jerram RM and Walker AM. Cranial cruciate ligament injury in the dog: pathophysiology, diagnosis and treatment. N Z Vet J. 2003;5:149-158. Gerber C, et al. The lower-extremity musculature in chronic symptomatic instability of the anterior cruciate ligament. J Bone Joint Surg Am. 1985; 67:1034-1043. Solomonow M, et al. The synergistic action of the anterior cruciate ligament and thigh muscles in maintaining joint stability. Am J Sports Med. 1987;15:207-213. Berchuck M, et al. Gait adaptations by patients who have a deficient anterior cruciate ligament. J Bone Joint Surg Am. 1990;72:871-877. Andriacchi TP and Birac D. Functional testing in the anterior cruciate ligament-deficient knee. Clin Orthop Relat Res. 1993:40-47. Wexler G, et al. Functional gait adaptations in patients with anterior cruciate ligament deficiency over time. Clin Orthop Relat Res. 1998:166-175. Edström L. Selective atrophy of red muscle fibres in the quadriceps in long-standing knee-joint dysfunction. Injuries to the anterior cruciate ligament. J Neurol Sci. 1970;11:551-558. Nakamura T, et al. Muscle fiber atrophy in the quadriceps in knee-joint disorders. Histochemical studies on 112 cases. Arch Orthop Trauma Surg. 1986;105:163-169. Baugher WH, et al. Quadriceps atrophy in the anterior cruciate insufficient knee. Am J Sports Med. 1984 12:192-195. Okada Y. Histochemical study on the atrophy of the quadriceps femoris muscle caused by knee joint injuries of rats. Hiroshima J Med Sci. 1989;38:13-21. Chrisman CL. Electromyography in animals. In: Bojrab MJ Eds. Pathophysiology in small animal surgery. Lea & Febiger. Philadelphia. 1981;831-850. Ludin HP. Praktische Elektromyographie. 5 edn. Enke. Stuttgart. 1997. Cuddon PA. Electrophysiology in neuromuscular disease. Vet Clin North Am Small Anim Pract. 2002;32:31-62. Heckmann R. Grundlagen und Methodik zu klinisch-neurophysiologischen Untersuchungen beim Hund: Elektromyographie (EMG), Elektroneurographie (ENG), Evozierte Potentiale (EP). Enke. Stuttgart. 1989. Conrad B. Das EMG-Buch: Antworten auf alle Fragen zu Methodik und Befundinterpretation. Thieme. Stuttgart. 1998. Engel WK and Cunningham GG. Rapid examination of Muscle tissue. An improved trichrome method for fresh-frozen biopsy sections. Neurology. 1963;13:919-923. Dubowitz V, et al. Muscle biopsy a modern approach. Saunders. Philadelphia. 1973. Paatsama S and Sittnikow K. Early changes in the knee joint due to instability induced by cutting of the anterior cruciate ligament. An experimental study in young dogs. Acta Radiol Suppl. 1972;319:169-73. Tibone JE and Antich TJ. Electromyographic analysis of the anterior cruciate ligament-deficient knee. Clin Orthop Relat Res. 1993:35-39. Ciccotti MG, et al. An electromyographic analysis of the knee during functional activities. II. The anterior cruciate ligament-deficient and -reconstructed profiles. Am J Sports Med. 1994;22:651-658. Bulgheroni P, et al. Gait patterns after anterior cruciate ligament reconstruction. Knee Surg Sports Traumatol Arthrosc. 1997;5:4-21. Williams GN, et al. Specificity of muscle action after anterior cruciate ligament injury. J Orthop Res. 2003;21:1131-1137. Baratta R, et al. Muscular coactivation. The role of the antagonist musculature in maintaining knee stability. Am J Sports Med. 1988;16:113-122. Buchanan TS and Lloyd DG. Muscle activation at the human knee during isometric flexion-extension and varus-valgus loads. J Orthop Res. 1997;15:11-17. Mostafa AA, et al. Morphometric Characteristics of the Pelvic Limb Musculature of Labrador Retrievers with and without Cranial Cruciate Ligament Deficiency Vet Surg. 2010;39:380-389. Seebeck P, et al. Gait evaluation: a tool to monitor bone healing? Clin Biomech (Bristol, Avon), 2005;20:883-891. Maitland ME, et al. Longitudinal measurement of tibial motion relative to the femur during passive displacements in the cat before and after anterior cruciate ligament transection. J Orthop Res. 1998;16:448-454.